The wrapping of holiday gifts is often believed to be one of the more tedious tasks of the season. If you have a lot of wrapping to complete this season and are looking for ways to organize and streamline the process, use one of our simple tips. 1) Wrapping Party: Make wrapping fun, by inviting a friend or two to join you. They can bring over their gifts and as a group you can get the task completed while enjoying some quality time with each other. 2) Enlist Help: If you have older children who are capable of wrapping, consider assigning each family member another member’s gifts to wrap. This way each person is only responsible for one set of gifts to wrap. This will help to lessen the burden on you. 3) Gift Bags: We know they aren’t the prettiest of wrapping options, but gift bags are both quick and reusable, thus saving time and money. These are also helpful when little ones want to assist in the wrapping process. 4) Wrapping Services: If you truly do not have time to wrap, get help from a professional. We wrap many of our client’s gifts each year and even offer a discount on holiday service packages. Contact us for details. 5) Sending Gifts: When purchasing gifts that will be shipped to their final destination, attempt to buy online and select the gift wrapping option. Often times, the cost to ship through the online shop is cheaper than if you were to buy locally and ship yourself, leaving you with extra money for the gift wrap option. You may also order gift baskets in Ottawa which look beautiful and often don’t need wrapping at all. 6) Supplies: Before starting a wrapping session, check your supplies and make sure that you have ample amounts of tape, paper, decorative accessories, and a good pair of scissors. 7) Wrapping Paper Tips: Keep the presents organized by assigning each person in the family a specific wrapping paper design. 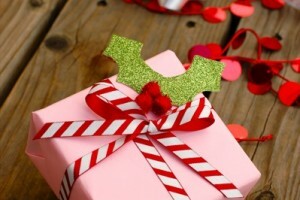 Using this strategy helps to keep clear which packages are for which person and can also save you money on gift tags. 8) Little-by-Little: While some people prefer to get all wrapping done at once, others do not have a large chunk of time to commit. If you fall into this category, commit to wrapping one to two presents per day until the holiday arrives. 9) Keep It Simple: Martha Stewart-esque packages are lovely to give and receive, but that level of decorative creativity is not for everyone. Make wrapping easy by choosing a single type of decorative element for this year’s gifts. For example, this year you could use only ribbon or printed tape or bows, but not all. 10) Odd-Shaped Items: When you’ve got something with an unusual shape, don’t worry about attempting to wrap it. Simply get an oversized bow and hide the item until the present opening session begins. For more wrapping tips and other holiday organization strategies, check out our printable ebook, Holiday Planner: A Comprehensive Organizing Guide for the Holiday Season on Lulu.com.